United are unbeaten in three games so could they take all three points today to stop Chelsea's unbeaten streak? United took to the stage to go four games unbeaten but the Chelsea Veteran Didier Drogba thumped in a well executed header into the goal of United versus the stranded De Gea who was blocked off by Eden Hazard. The game got underway at Old Trafford for United's biggest challenge of the season so far in the BPL this season versus Whom where league leaders. The game started off slow but picked up the pace going into the ten minute mark and their where no main chances going for any side. De Gea got troubled by a free kick from Chelsea but the Spaniard kept hold of the free kick but the ball went back to Chelsea and it was a corner but it was cleared and Chelsea are dominating early on. Passes are getting intercepted and the play was not good enough going into the fifteen minute period. Hazard and Di Maria had a scrap as an elbow went into the face of the United player from the Belgian. Di Maria took a quick free kick but the ref had his back faced and the free kick had to be taken again. United was rather quiet as the game was not going anywhere twenty minutes in. Two chances in two minutes but none of them where taken well from any side. Half Time was just around the corner and it was still Utd 0 - 0 Chelsea. Willian got the better of Rojo but the Brazillian took a heavy touch and Smalling got the ball. Oscar was on a run, he ran the ball through to Drogba but De Gea stretched out to save the Ivorian's shot. Ivanovic challenged Januzaj and Mata took the free kick but it went far over the crossbar and the whistle went for half time and the scores where level as no goals where scored. The second half is underway and they started off with a yellow card for Ivanovic. 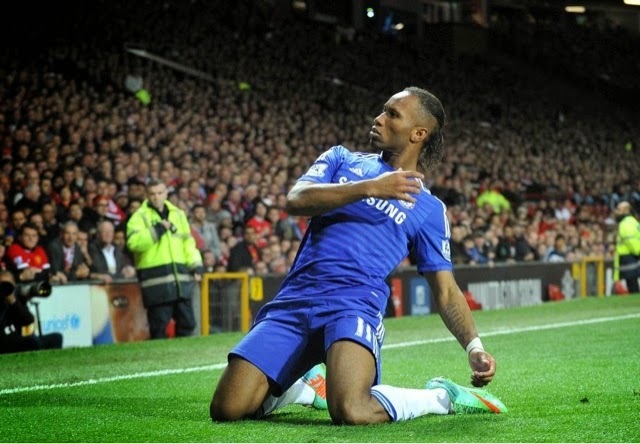 It took 52 minutes for Chelsea to break through with a thumping header from Didier Drogba! Shoot, Shoot, Shoot was Van Gaal's orders in this second half since the Drogba goal. Utd 0 - 1 Chelsea. United took their chances carefully but Courtois was pouncing into every chance that United got on target. So far in this game Fellaini, Ivanovic and Oscar go into the book as Full time was approaching. Today Thibaut Courtois is well and truly unbeatable to the opinion of Manchester United. Eden Hazard picked up yellow and he automatically got subbed off and Shurrle came on. In the last minute drama occurred while. Ivanovic gets red, Van Persie scores from the free kick, after it comes out to the Dutchman who sweeps it in. United where looking for three points but Chelsea where looking to keep unbeaten as they did, United are also facing Man City next week and Arsenal the week after where they could drop or win three points in them two games that could mean a lot to either of them 3 teams seasons. A last-breath equaliser by Angel Di Maria sees Man Utd scrape a draw against Chelsea at Old Trafford.